Fluid Forum View - Check It Out! Hey is any one on here any more ? I was wondering if any one has heard from Oxidized black ? He town is on fire in Canada .. And reports say most of the town is or will burn from the wild fire. Any responce from the regulars on here would be great.. Try to contact him if any one knows him please .. Thank you. So haw many of you guys have an ignition point file in your tool box? signs and decals declaring she was a public servant. We figured it must be true. darn letters. We figured wrong on all accounts. land. He figured we would all have the same freedom. He figured wrong. traditions that came naturally and innocently in her youth to her tots. is CLOSED to access – unless of course you want to haul your buns in there via boot rubber. gate that’s in my backyard. I don’t think I’m figuring wrong anymore. recreationists nationwide. 1‐800‐258‐3742. BlueRibbon Coalition: Preserving your recreational access to public lands. WASHINGTON, DC - A coalition of recreational access groups moved today to join a lawsuit challenging Bureau of Land Management (BLM) plans covering nearly seven million acres in Utah. 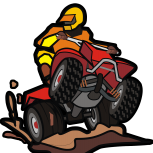 The motion was filed by the Trails Preservation Alliance (TPA), Colorado Off-Highway Vehicle Coalition (COHVCO), and BlueRibbon Coalition (BRC), all trails-based, grassroots recreation advocacy groups. The lawsuit was filed by eleven preservationist groups, led by the Southern Utah Wilderness Alliance. Through the suit, the plaintiffs hope to have the BLM plans declared illegal and set aside, and ask the Court to issue an injunction preventing activities authorized by the plans until BLM issues new decisions complying with a host of federal statutes. The lands at issue are located in the BLM Moab, Price, and Vernal Field Offices, which include iconic destinations for all types of backcountry recreationists. "Our groups have carefully participated in these planning processes," said Don Riggle, TPA founder. "We are far from satisfied with the final BLM decisions, but can obviously see that SUWA is attempting, through this suit, to close off access to even those trails that survived the designation process," Riggle concluded. "Our courtroom relationship with SUWA stretches back nearly a decade, and this suit seemingly breathes continuing life into that relationship," added Brian Hawthorne, BRC Public Lands Policy Director. The lawsuit was originally filed on December 17, 2008, and targeted 77 lease sales for oil and gas drilling on BLM-managed lands. Those sales were halted by a temporary restraining order issued by the Court on January 17, 2009. The latest complaint, filed March 19, 2009, drops the claims against the oil and gas leasing projects, which BLM has apparently withdrawn. However, the current complaint adds claims addressing other uses, including off-highway vehicle use. The Recreational Groups and SUWA have waged prior battles over BLM's management of Utah lands, most notably including a 2000 lawsuit by which SUWA sought to compel agency action meeting SUWA's vision of that required by BLM. In that suit, the Recreational Groups filed a motion to dismiss the case on jurisdictional grounds, which was granted by the U.S. District Court for the District of Utah, reversed by the Tenth Circuit Court of Appeals, but ultimately affirmed by the U.S. Supreme Court in 2004. During and subsequent to that case, BLM has been preparing the land use plans and travel management designations now under challenge in the present suit. The BlueRibbon Coalition is a national recreation group that champions responsible use of recreation, and encourages individual environmental stewardship. It represents over 10,000 individual members and 1,200 organization and business members, for a combined total of over 600,000 recreationists nationwide. 1-800-258-3742. BlueRibbon Coalition: Preserving your recreational access to public lands.